I couldn’t write on Friday morning because I was busy uncovering all the tender plants that I had gambled with. We did get that late light frost. The grass was nicely white as was the roof of the garage. My reluctance to plant before the 24th of May actually looks like prudence not procrastination. The few things that I did have out don’t seem to have suffered much but they were either up off the ground or protected over night. The Asparagus continues to feed us almost every day and I’m accumulating a nice bag full in the fridge that will become Asparagus soup sometime in the next few days. I spent Thursday morning touring some wonderful gardens. It was the media preview of Through the Garden Gate the Toronto Botanical Garden’s annual garden tour. This year it wanders through 19 gardens in the Lawrence Park district. They have tried to choose many gardens that are developed and maintained by their owners and that leads to a great diversity of styles. For a plant addict like me it also lets me see some amazing plant specimens that might not be seen in commercially created gardens. 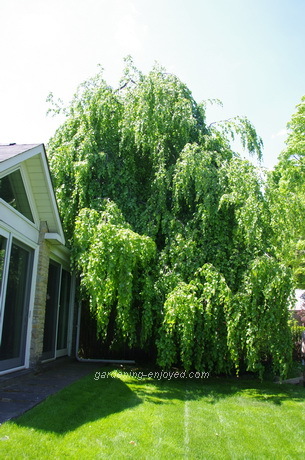 The entrance to one back yard, through the draping branches a large weeping Beech, was like the passage way to a secret garden. The tour is on the 13th and 14th of June and is a great way to peek into the gardens around some fascinating architecture. It’s also the Toronto Botanical Gardens major fund raising activity for the year and they are a cause well worth supporting. Earlier in the week a wonderful box arrived. It contained 3 rather dead looking sets of branches. 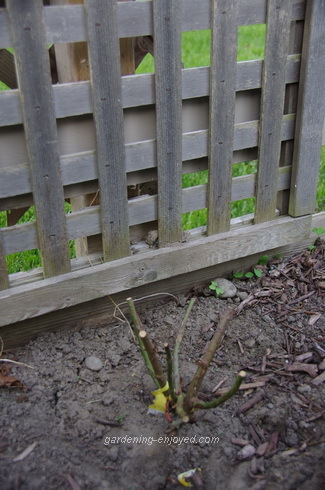 They were anything but dead but dormant bare root Roses are just a collection of brown roots and green branches. These were my new David Austin Roses. New Roses were particularly welcome this year as the very cold winter had taken its toll on some of my old favourites. A new variety they are introducing this year is the The Albrighton Rambler which they describe as having small, cup-shaped, perfectly formed flowers of softest pink that pale to blush. I’m hoping it will cover one of my 2.4M (8') trellises and rebloom through the summer as promised. Many of the David Austin roses, including the other two in that box, Shropshire Lad and Windermere, are now grown on their own roots which tends to make them hardier and thus more welcome in my garden. If it performs as these roses usually do I will show you a much more interesting picture later in the summer. In our part of the world we plant them quite deep so that the graft union is a few centimeters under the soil to protect it from our cold winters. 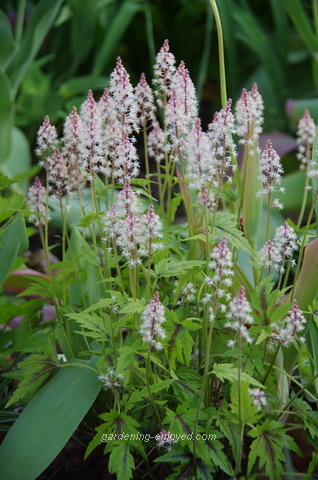 Tiarella is a native woodland perennial with delicate sprays of flowers standing high above the foliage in the late spring. In the last few years it has been discovered by the plant breeders and there is now an increasing number of varieties available. One of their best features is their tolerance for shade. I planted one under my Harlequin Maple last year when I was making the new path there. It is now in full bloom and my inability to keep decent records is irritating me as I cannot determine which variety it is. It’s a great foil for Hosta in the shade garden, where it’s light, patterned leaves and delicate spring flowers provide a great contrast to the heavy leaves and late summer flowers of the Hosta. Some of the varieties will spread by underground runners to make a reasonable ground cover and others maintain a clumping nature. Read labels to make sure that you choose a variety that does what you want it to. They are all happy in the shade and some prefer moist woodland soils while others are quite tolerant of dry shade. Donna Asks? I have a couple of the older peonies that are outgrowing the supports I have. What do you recommend to use on the big peonies? I was thinking chicken wire. Thanks and enjoy your emails. Ken Answers! I was told of a simple solution for this problem. Use two peony rings that overlap each other in the centre. Tried it, works great. Carol Asks? To turn or not to turn? My hubby feeds the birds and squirrels all Winter on the extended window ledge right above one of my flowerbeds. Normally, I haul away a 'bushel' of the peanuts shells and seed coverings. Does it make sense to turn them over as compost in my bed - before anymore seeds flourish as "seed weeds"? BTW, love your Spring garden shots. Ken Answers! The peanut shells would probably make great compost but not in a hurry. I might put them in my compost heap but just turning them into the soil would certainly be less work and they will eventually decompose. Fallen bird seed always makes for an “interesting” garden. Sherry Asks? I always enjoy your newsletter and learn at least one new thing! I was interested to learn about the coconut shell mulch. You mentioned its durability and that it will keep your hosta comfortable and weed free for several years. I like to add compost to my (mostly) clay soil each year, which covers up my mulch so then I need to mulch all over again. I'd be interested in your comments as to how you deal with this. Ken Answers! Mulching and adding compost are essentially mutually exclusive. My compost goes on the vegetable and annual flower beds and they don't get mulched for that reason. Perennials get their soil well amended as they are planted and they have to make do with that unless it's time for a big makeover and then I would try and remove as much of the mulch as I could. Your compost could be applied instead of a mulch but if it's like mine it is full of weed seeds and would be a disaster. If I was diligent enough about my weeding and pulled them all before they went to seed that would help my compost but realistically that's not going to happen.